His offspring convinces with good tallness, a wonderful Trakehner type, harmony and movements with a lot of impulsion and cadence. Up to now he has 9 sons who became sires - Neumünster 2001 his son "Sharan" out of a thorougbred mare! He is as well sire of a lot of champions and vize-champions of broodmare-shows and performance tests for bloodmares. (DM 140.000,-- and DM 110.000,--). Every year Schwadroneur has most of the participants in the final round of the championships in denmark. He is the most successful sire of dressage horses. In march 2000 he won "sire of the year". You'll find his offspring in a lot of renowed dressage bains in denmark. More than 10 of his daughters and sons are successful in to Grand Prix level. Elite dam "Schwalbenburg" has 4 sons; beside "Schwadroneur" "Showmaster" (victorious at Grand-Prix level), "Stradivari" (class I after stallion performance test and victorious in show-jumping up to medium level and "Sans Souci"chief-sire at the state-owned stud in Moritzburg. She is also dam of vize-chamioness at the Bundesstutenschau at Neustadt/Dosse in 1997 "Schwalbenlust" (as well victorious at the brood-mare show at Niedersachsen) and her half-sister "Burgschwalbe" (dam of champion "Seigneur"), elite-mare "Schwalenburg" and premium-mare "Sacre Coeur" by Upan la Jarthe AA. 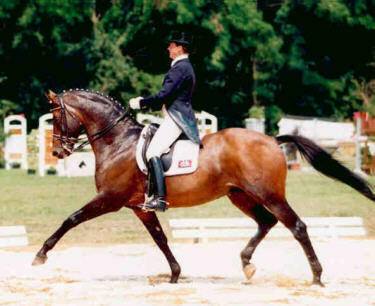 The sire of "Schwalbenburg", DLG-champion "Ibikus" (victorious at advanced level in dressage tests and four time dressage champion) had a big influence on the trakehner breed. He is well known as sire of a lot of wonderful and successful riding horses. Also his sire "Hertilas" was victorious at advanced level. Granddam elite-mare "Schwalbenlied" was champion of the horse show for young riding horses at Hamburg, she won vize-champion at Wiesbaden as well placed behind "Ibikus". She is dam of champion "Santiago" by "Wie Ibikus". Elite dam "Schwarze Schwalbe" is a doughter of the famous elite-dam "Schwalbe" by Totilas and dam of several great broodmares as well as 3 approved sires: "Schwalbenfreund", "Schwalbenflug" and "Schwalbenzug". "Arogno", vize-champion 1978, elite-sire and sire of the year is one of the major sires of the trakehner breed. He started a new era with fresh accents on riding horse quality and talent of dressage horses. Beside "Schwadroneur" he is sire of "Karon", "Traumdeuter", "Napoleon Quatre", "Louidor" and "Giorgio Armani".